Aorta-right atrial tunnel (ARAT) is a rare congenital anomaly characterized by extracardiac tunnel-like vascular connection between aorta and right atrium. Patients are usually asymptomatic, but patient may present with palpitation, dyspnea, and fatigue on exertion. Diagnosis can be made by transthoracic echocardiography during investigations for continuous murmur. Diagnosis can be confirmed by computed tomography, aortography, and coronary angiography. We report a case of a 26-year-old man diagnosed with ARAT arising from right sinotubular junction extending anteriorly and opening into right atrium near the opening of superior vena cava complicated with cardiomegaly and heart failure. Aorta-right atrial tunnel (ARAT) is a very rare congenital cardiac anomaly first described by Otero Coto et al. in 1980. Congenital ARAT is an extracardiac vascular communication between one of the aortic sinuses and right atrium. This anomaly can be associated with coronary artery anomalies. Clinical presentation ranges from asymptomatic precordial murmur to congenital heart failure. A 26-year man was admitted with symptoms of progressive dyspnea for 1 year and pedal edema, abdominal distension, and facial puffiness for 1 month. His functional capacity was New York Heart Association Class III. On physical examination, tachycardia and tachypnea were present; jugular venous pressure was raised; and bilateral pitting type of pedal edema was present. His cardiovascular examination showed hyperkinetic precordium with audible S3, 3/6 continuous murmur along the right parasternal region of the third and fourth intercostal spaces, and early diastolic murmur in the neoaortic area. Respiratory system examination revealed bilateral basal crepitations. 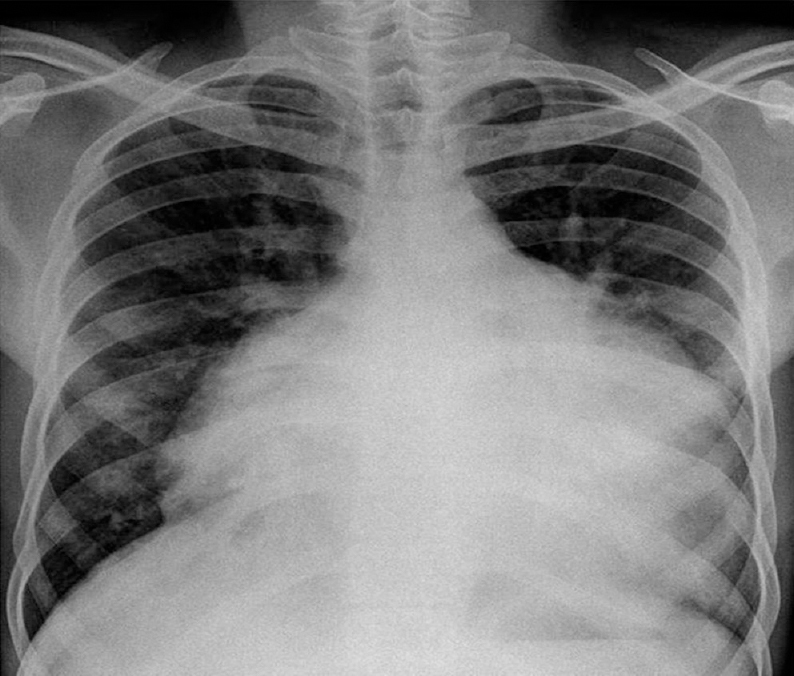 Chest X-ray showed cardiomegaly [Figure 1]. Transthoracic two-dimensional (2D) echocardiography revealed dilatation of all cardiac chambers, severe aortic regurgitation (AR), severe tricuspid regurgitation, minimal pericardial effusion, abnormal flow from aorta to right atrium, and tunnel-like structure from right aortic sinus to right atrium [Figure 2]. Contrast computed tomography chest revealed a tubular connection of maximum diameter of 17.5 mm and approximately length of 97 mm between aorta and right atrium arising from right sinotubular junction extending anteriorly and turning posterosuperiorly to open into right atrium near the opening of superior vena cava. The right coronary artery was arising just below this tubular structure. The left main coronary artery was arising above the left aortic sinus just near left sinotubular junction suggestive of high take off of left coronary artery [Figure 3]. Surgical closure of aortic end of tunnel was done with dacron patch after antegrade cold sanguineous cardioplegia. Antegrade cold sanguineous cardioplegia was achieved under cardiopulmonary bypass established with aortic and bicaval cannulation. Venous grafting of the right coronary artery was also done with graft [Figure 4]. ARAT is rare congenital anomaly characterized by extracardiac tunnel arising from aortic sinus and emptying into the right atrium. The largest case study of nine patients was reported by Gajjar et al. The etiology is unknown; hypothesized mechanism includes congenital deficiency of elastic lamina in aortic media which gradually enlarges under the influence of high aortic pressure to form an extracardiac tunnel. Other mechanism includes persistent mesocardial cyst and abnormal formation of supravalvular ridge. The posterior type originating from the left sinus of Valsalva is more common than anterior type which originates from the right sinus of Valsalva. Patients with ARAT may be asymptomatic or present with palpitation, exertional breathlessness, easy fatigability, and recurrent upper respiratory tract infections. In asymptomatic patients, it is often detected while evaluating heart murmur. The continued patency of tunnel may lead to aortic reguargitation (AR), calcification of valves, biventricular volume overload, aneurysmal expansion congenital heart failure, pulmonary vascular disease, and infective endocarditis. Coronary cavernous fistula can be differentiated from this condition with 2D echocardiography by visualizing both coronaries arising separately away from tunnel or tunnel itself. Patent ductus arteriosus and ruptured sinus of Valsalva aneurysm can be differentiated by demonstrating a tunnel with extracardiac course. A patient presenting with continuous murmur in the right parasternal region, a differential diagnosis of ARAT should be kept. After the diagnosis, any closure option should be recommended to the patient considering the potential risk of complication such as cardiac failure, endocardial aneurysm formation, or rupture. Although surgical closure is the treatment of choice, transcatheter techniques through percutaneous route and the introduction of new occluder devices are now a successful modality of treatment. The authors thank the visiting cardiologist Dr. R. Ghodeshwar for his contribution to the present report. Coto EO, Caffarena JM, Such M, Marques JL. Aorta – Right atrial communication. Report of an unusual case. J Thorac Cardiovasc Surg 1980;80:941-4. Fernandes ED, Kadivar H, Hallman GL, Reul GJ, Ott DA, Cooley DA, et al. Congenital malformations of the coronary arteries: The texas heart institute experience. Ann Thorac Surg 1992;54:732-40. Gajjar T, Voleti C, Matta R, Iyer R, Dash PK, Desai N, et al. Aorta-right atrial tunnel: Clinical presentation, diagnostic criteria, and surgical options. J Thorac Cardiovasc Surg 2005;130:1287-92. Omeroglu SN, Goksedef D, Balkanay OO, Ipek G. Aorta-right atrial tunnel in an adult. Eur J Cardiothorac Surg 2014;45:580-1. Kalangos A, Beghetti M, Vala D, Chraibi S, Faidutti B. Aorticoright atrial tunnel. Ann Thorac Surg 2000;69:635-7. Rosenberg H, Williams WG, Trusler GA, Smallhorn J, Rowe RD, Moes CA, et al. Congenital aortico-right atrial communications. The dilemma of differentiation from coronary-cameral fistula. J Thorac Cardiovasc Surg 1986;91:841-7. Türkay C, Gölbaşi I, Belgi A, Tepe S, Bayezid O. Aorta-right atrial tunnel. J Thorac Cardiovasc Surg 2003;125:1058-60. Sai Krishna C, Baruah DK, Reddy GV, Panigrahi NK, Suman K, Kumar PV, et al. Aorta-right atrial tunnel. Tex Heart Inst J 2010;37:480-2. Katayama Y, Ozawa T, Iga A, Hisatake S, Watanabe Y. Surgical repair of aorta-right atrial tunnel in an adult. Circ J 2015;79:892-3. Narin N, Pamukcu O. Percutaneous closure of aorta-right atrial tunnel in a newborn. Cardiol Young 2018;28:142-3. Tossios P, Sarlis G, Aidonidis G, Karatzopoulos A, Grosomanidis V, Kouskouras K, et al. 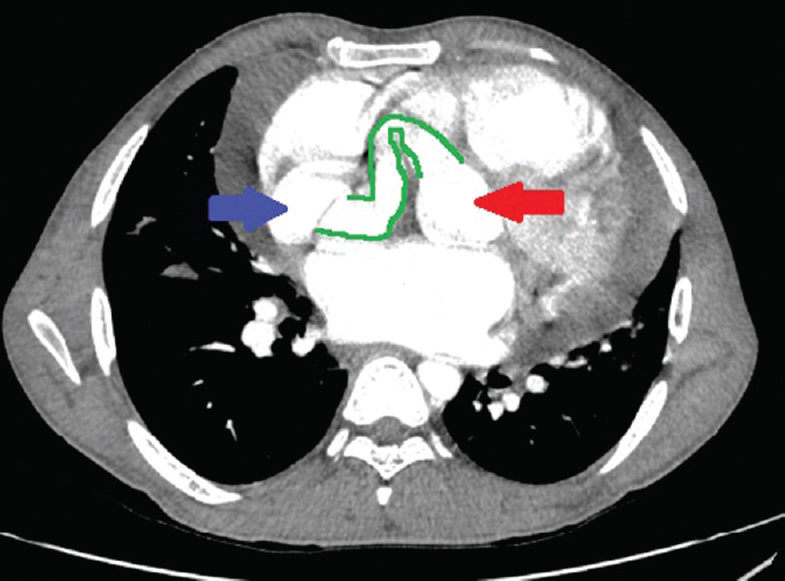 Aorta-right atrial tunnel: Imaging and surgical repair in an adult patient. J Cardiothorac Vasc Anesth 2014;28:1314-8. Lee S, Kim SW, Im SI, Yong HS, Choi CU, Lim HE, et al. Aorta-right atrial tunnel: Is surgical correction mandatory? Circulation 2016;133:e454-7. Baykan A, Narin N, Ozyurt A, Uzum K. Aorta-right atrial tunnel closure using the transcatheter technique: A case of a 3-year-old child. Cardiol Young 2013;23:457-9.